When I started to read Truthwitch, I got a bit confused. There wasn’t a lot of explanation about how everything in this world worked or about the new words that were introduced or about the magic system. Everything was very complex and Susan Dennard didn’t take any time to explain or set up. Eventually, once the story advanced, everything got a lot clearer and I realised it was actually a very fascinating and intricate world and magic system. I couldn’t get enought of it and I defintely want to find out more about it in future books. Apart from that, the writing was amazing, it was beautiful, fluid and captivating. It went really well with the fast paced of the story; there was always something happening! On top of that, the characters were definitely one of the best parts of the book. Iseult was my favorite characters, I found her to be really intriguing and fascinating. I loved how the author talked about discrimination through her character and I really liked how complex Iseult was; she always tried to be what her culture expected her to be, but she couldn’t because it wasn’t who she really was. Also, I enjoyed her relationship with Aeduan immensely even if it was not that present in the book; I was really intrigued by him as a character and I really want to see how their relationship develops. I also really liked Safi, even if I didn’t find her as interesting as Iseult. She was a bit impulsive sometimes, but she was brave and clever, and I really enjoyed her relationship with Merik. And now the most important thing, the relationship between Safi and Iseult. It’s weird to find a YA fantasy book that focuses mainly in the friendship between two female characters and I think that’s the caracteristic that made this book stand out. Furthermore, it’s a relationship based on love, respect, and support of one another. 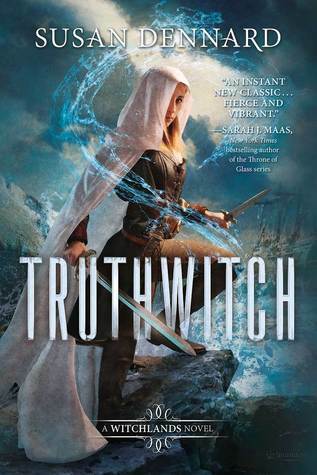 Truthwitch is a book with a complex and fascinating world and magic system, with a captivating writing style and with compelling and gripping characters. If you haven’t read it yet, you should! I've heard of this book so much espeically before it came out I remeber everyone saying they couldn't wait to get their hands on it. I don't know if it sounds like my type of book but I really want to try it out considering I've heard so many great things about it! Plus you obviously enjoyed it a lot so that always intrigues me to read a book.